The biggest ingredient in beer is water, so it makes sense that the particular type of water that the brewer uses is going to have a distinct effect on the finished drink. In that sense, Einstök would seem to have a slight advantage, with their brewery perched on the northern shores of Iceland, in a fishing port called Akureyi, about 60 miles south of the Arctic Circle. The water they brew with comes from rain falling on Hlíðarfjall Mountain, and it’s filtered through lava fields. They talk of it as the purest water on earth, and given that it comes from one of the most unspoiled parts of the planet and is naturally filtered through volcanic rock, there may just be something in that. 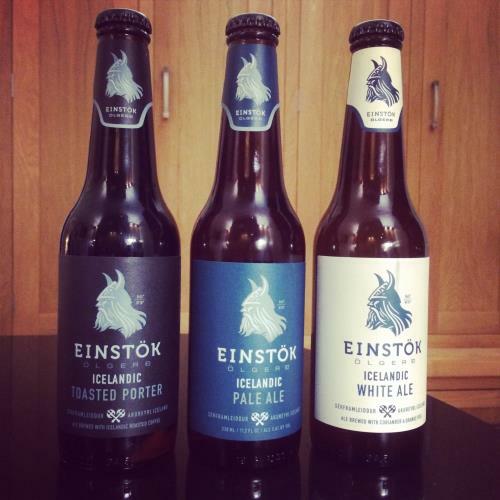 I tried three of Einstok’s range, all very different beers. The first, a Toasted Porter was a classic example of the style – rich, smoky, dark and mysterious, with a thin, light brown head that disappeared quickly to reveal a jet black beer with tastes of cocoa and maybe very dark brown sugar. The second, White Ale, was a Belgian style wheat beer that was light and refreshingly cool, with the generous aroma of hops, and the third, Pale Ale, was an American style pale, with a hint of bitterness and malt underneath. All three benefit from the quality of the base ingredient, and all three are brewed with care and skill. These are quality beers that borrow the best of Northern European and American craft brewing traditions and reinterpret them with a distinct Icelandic edge. As with many things Icelandic, there’s a quiet gentleness about these beers that overlays a confident and purposeful quality.